The "Kek" is the Kekekabic Trail, the western portion of the NCT route across the Minnesota Arrowhead, about 45 miles. Matt adds: "Here is a volunteer opportunity for anyone who is interested in hiking the Kek or Border Route Trail this year. 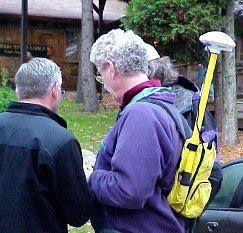 The U.S. Forest Service could really use someone detail-oriented and interested in GPS to record some data on the Trail. They'll provide the training and the GPS unit."